Hand stitching is an essential sewing skill every sewer must possess and master. With machine stitching, you might think hand stitching is a thing of the past, but it’s not really. As you progress to more complicated sewing projects, you’ll find your sewing machine skills can only do so much and a lot of the finer details are still done by hand. 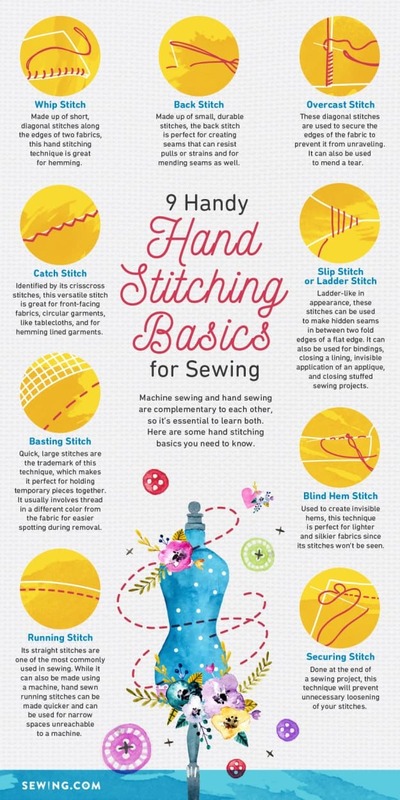 Learn the basics and the essential hand stitches here! Pull the thread or your threaded needle through your top fabric, making sure the knot stays in between the two fabrics. Pierce through your bottom fabric and exit at the same place you started with on the top fabric. This will lock in your starting stitches in place. Push the needle through the bottom fabric, creating a diagonal stitch on the edges of your fabric. Your needle and thread must exit the top fabric to secure the fabrics together. Repeat the process until you’ve reached the ends of your fabrics. Don’t forget to lock in your stitches. Starting at the opposite end of where you usually start, pull the thread or your threaded needle. Make a diagonal stitch from where you popped your threaded needle to the other fabric. Pull your threaded needle a small length away and make a diagonal stitch back to your starting fabric. Get a bit of your fabric and continue making diagonal stitches until you’ve attached the two fabrics. Take the needle in and out of the fabric of up to ¼ to ½ inch long. You can make several stitches by popping the needle in and out of the fabric before pulling through. Do not lock the stitch from both ends. Take the needle in and out of the fabric up to your desired stitch length. You may also make several stitches by popping your needle in and out the fabric at equidistant lengths before pulling your needle through the fabric. Lock your stitches once you’re done. Pull your threaded needle from the underside of your fabric. Make a single running stitch. From the underside of your fabric, pull the thread to keep the stitch taut. Bring your needle up again, piercing through the fabric at a distance equivalent to the length of your single running stitch. Use the photo above for reference. Repeat the process until you finish your stitches. Start on the other side of the raw edge of the fabric. Make a series of slanted stitches equally spaced and make sure they are looped around the two fabrics’ edges. Iron the folds of the fabric. Take the threaded needle underneath the fold to hide the knot. Pull the needle and thread out from the folded edge. Grab a little bit of fabric underneath from the opposite side of the folded fabric. Insert the needle again to the opposite side. Repeat the same pattern until you close the opening. Slip the threaded needle underneath the folded side of the fabric to hide the knot. From underneath, pull your needle out and through. Grab a bit of the fabric underneath where the hem is sitting. Then, grab the folded part of the fabric again from the side where you started. Repeat the same pattern until you finish the opening. Make a small back stitch and create a loop thread. Point the needles inside the loop and pull through. Repeat the process twice to make a small knot and to make a stronger lock. Learning these essential hand stitching techniques is quick and easy! And even better, this knowledge will definitely stay with you forever, as you will surely be using them in your various sewing projects. Keep on practicing them for more embroidery stitches. Soon, you’ll surely master these essential stitching techniques. Do you know of other essential hand stitching techniques? Let us know in the comments below! Editor’s Note: This post was originally published on November 24, 2016, and has been updated for quality and relevancy. I did like this As much as I have sewn, not usually by hand, kind of self taught, I now know the different stitches and how to use them if I need to. As did I like this cite. I am in my seventies. I learned at my mothers elbow. She sewed for clients and I did all the hand stitching. As I’ve aged, sewing by machine is difficult as it became for my Mother, however I still enjoy hand stitching. Although I have never made a garment by hand only, I would like to try. Do you have any suggestions?